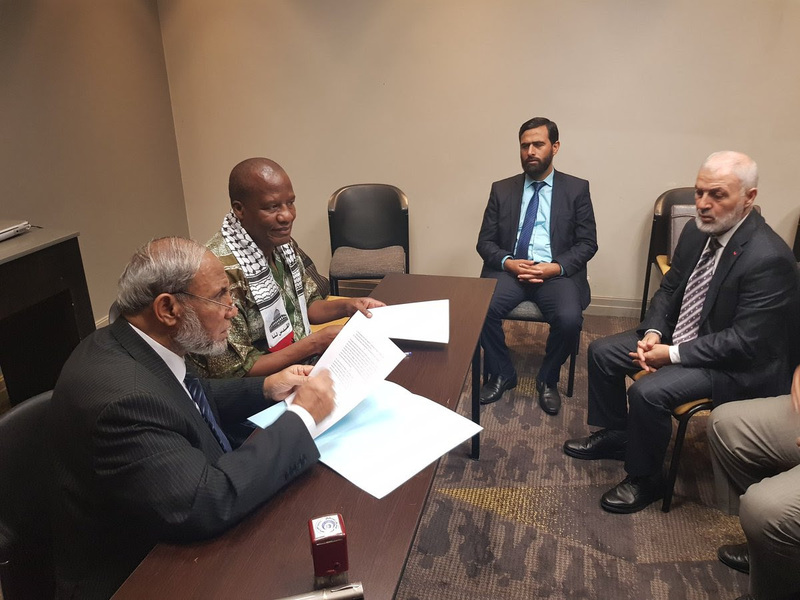 Hamas politician, Mahmoud al-Zahar (left), signs a Memorandum of Understanding with Jackson Mthembu of the ANC Parliamentary Caucus in Johannesburg, South Africa. In a sign of warming relations, parliamentarians from Hamas’s Change and Reform Bloc (CPRB) have signed a Memorandum of Understanding (MoU) with the African National Congress’s (ANC) Parliamentary Caucus. The MoU was signed by CPRB’s Mahmoud al-Zahar and the ANC Parliamentary Caucus’s Jackson Mthembu, and seeks to introduce practical steps in mobilizing the international community to pressure Israel to end its occupation of Palestine, including working towards the full boycott of all Israeli products. According to the MoU, the ANC Parliamentary Caucus will use the oversight powers of South Africa's parliament to ensure that the ANC’s 2017 resolution to downgrade the South African embassy in Tel Aviv to a liaison office, is implemented by the South African government. The move was welcomed by several pro-Palestine groups in South Africa. In 2015, the ANC established formal party-to-party relations with Hamas.